It's their third full-length album. They've toured with Fall Out Boy, Gym Class Heroes, Motion City Soundtrack, Hawthorne Heights, and The Format. Out of this, a handful of chart-topping singles have been spawned. Yet it's not enough to reflect in their music. They refuse to evolve with the rest of the sounds available in art today. Oh dear reader, if you are going to set any sort of resolution for the new year, please resolve to DEMAND better music from teenage punk pop. It exists. Reach deeper. Haunt the record stores more. Accept add request from little indie bands on MySpace. Stay diligent on the music blogs. 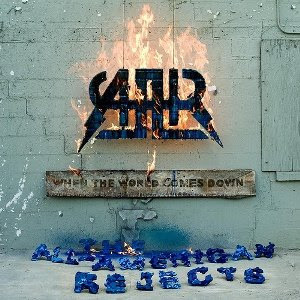 Bands like The All-American Rejects need to step up if they want your concert cash. This album, When The World Comes Down, opens with a horribly weak track called "I Wanna". What's sad about this track is that they obviously throw their energy into it, and listeners who haven't been able to experience truly good music will treat this like an anthem. Stop there. It's not. Nevermind the fact that there are more eloquent ways of expressing the lustful desires of our young bodies. These guys are in their mid-20's. They can figure this one out. Moving along through the album, we have an unlikely duet between Catherine Pierce and lead singer Tyson Ritter on "Another Heart Calls." Pierce has such a gorgeous voice but the pairing is awful. And several of the songs are so frustrating because it's difficult to tell what the story is... And not in a good way. It's one thing to have a dichotomy being expressed in any piece of art because of the confused position of the artist... But this is just not done in an artful way. It's done in the manner of an eight-year old aspiring songwriter, no offense intended to eight year olds. I want to say that "Back To Me" is a halfway decent track, but the lyrics thwart and disappoint me. I'll share it anyway, mostly because this is an mp3 blog but also because it is a decent piece of music that utilizes different instruments harmoniously. Now I am getting off my soapbox. See you next year!